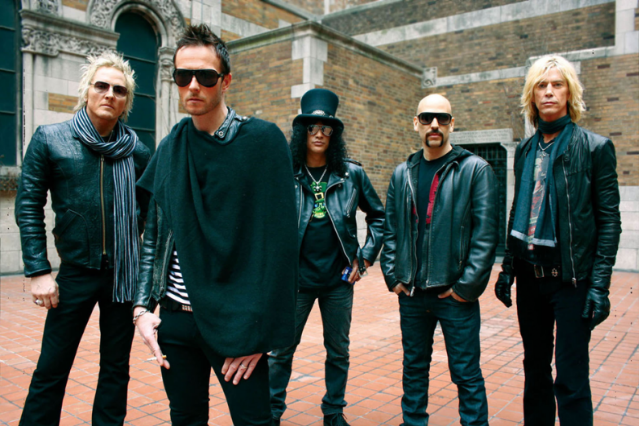 Scott Weiland is no stranger to weird radio interviews, but his onetime Velvet Revolver bandmate Slash is having a chuckle at a new chat Weiland conducted with ABC Radio. Weiland, who was axed from VR in 2008 over “increasingly erratic onstage behavior and personal problems,” reunited with the group for a one-off performance in January. And now he’s claimed that he’s rejoined the supergroup, who are, according to him, working on new material and planning a fall tour. “They gave me a couple of songs,” Weiland said, “and myself and [guitarist] Dave [Kushner] and [bassist] Duff [McKagan] are gonna be getting together for a songwriting session next week.” This was news, however, to Velvet Revolver’s guitarist, Slash, who basically laughed his way through a counter-interview on Minneapolis’ 93X station, saying he had no idea what the hell Weiland was talking about. “What? No, he’s out of his mind,” Slash said (listen to the audio over at Blabbermouth). “Maybe [the other band members] know something I don’t know… [but] I have absolutely no intention of going back to that.” He also pointed out, for the record, that he’ll be “on tour all year,” which would make it kind of hard for Velvet Revolver to “do some shows in the later part of summer into early fall,” as Weiland told ABC. Weiland’s Stone Temple Pilots have work on the horizon as well — a 20th anniversary Core tour this fall and reportedly new material in the works.